Principal town of the department Seine-et-Marne, France. There was a very important Jewish community here as early as the twelfth century. The scholars connected with the Talmudic school of the city took part in the synod held at Troyes about 1160 under the direction of Rashbam and R. Tam ("Kol Bo," No. 117, where must be read instead of ). A Jew of Melun, Vivant, was appointed in 1202 to collect the taxes of his coreligionists; another, Leo Crossius, obtained permission in 1204 to live at the Châtelet in Paris. In Dec., 1230, Saint Louis, King of France, together with the barons at a meeting held at Melun, promulgated the following decrees: (1) henceforth Jews will not be permitted to make contracts; (2) they will be considered the property of the barons in whose territory they live; (3) in cases of migration they may be forcibly returned to their former homes; (4) debts due to them shall become void if not collected within nine legal terms, and shall no longer bear interest; (5) the vouchers for their credits shall become worthless if not submitted to the barons before All Saints' Day. The Jews occupied a special quarter at Melun, called "La Iviferie," which is mentioned in the documents of the years 1206, 1212, and 1218, preserved in the archives of Notre Dame of Melun. In a document dated Jan. 5, 1307, there is a reference to the sale of a house and barn, situated in the Jews' street, that had belonged to the Jew Donin and his nephews. Another document, of the year 1311, refers to the sale of a house situated in the manor of the "hopital S. Jean de Hierusalem, rue de la Iviferie, iouxte la maison qu'on appelle l'eschole aux Juifs." In the library of Melun there is a manuscript of the fourteenth century entitled "Breviarium Judaicum," being a maḥzor (partly unedited), according to the French ritual, for the holy-days of Rosh ha-Shanah and Yom Kippur (described in detail by M. Schwab in "R. E. J." xiii. 296-299). Like the Jews in other parts of France, those of Melun were forced in 1306 by King Philip the Fair to leave the city without hopes of ever returning. 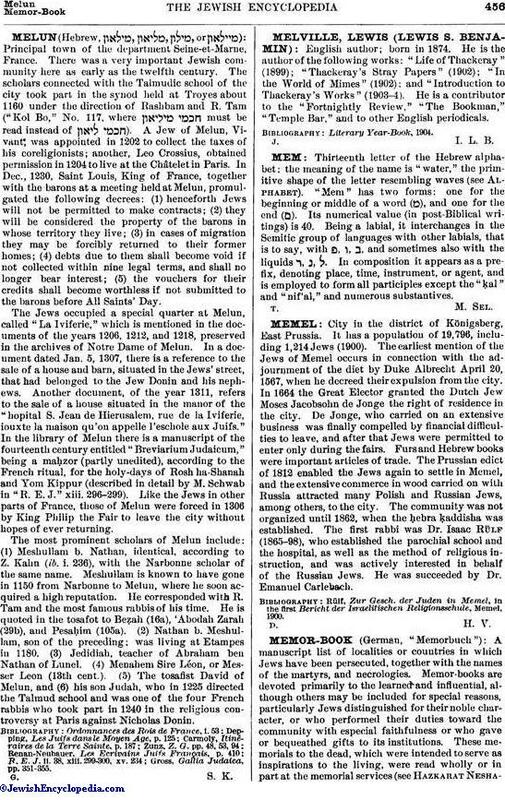 The most prominent scholars of Melun include: (1) Meshullam b. Nathan, identical, according to Z. Kahn (ib. i. 236), with the Narbonne scholar of the same name. Meshullam is known to have gone in 1150 from Narbonne to Melun, where he soon acquired a high reputation. He corresponded with R. Tam and the most famous rabbis of his time. He is quoted in the tosafot to Beẓah (16a), 'Abodah Zarah (29b), and Pesaḥim (105a). (2) Nathan b. Meshullam, son of the preceding; was living at Etampes in 1180. (3) Jedidiah, teacher of Abraham ben Nathan of Lunel. (4) Menahem Sire Léon, or Messer Leon (13th cent.). (5) The tosafist David of Melun, and (6) his son Judah, who in 1225 directed the Talmud school and was one of the four French rabbis who took part in 1240 in the religious controversy at Paris against Nicholas Donin. Gross, Gallia Judaica, pp. 351-355.